Take the guess work out of your weight loss goals and accurately track your progress with this advanced Remedy? 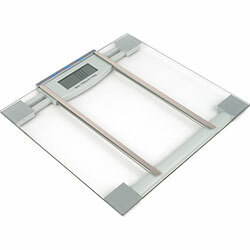 Digital Scale! The use of Bioelectrical Impedance Analysis technology allows the scale to accurately measure the user?s body fat and hydration percentages. Up to 10 people can enter their personal data in the memory of the unit so the whole family can track their weight loss. The stylish modern design of the Remedy? Digital Scale will make it a welcome addition to any bathroom.